As with most radically new technologies- the best learning period is shortly AFTER you start shipping a new product. The concept we introduced with the "Schauberger's Dream" corrected equation based implosive NOZZLE- has proven both powerful and popular. The shower nozzle alone- has exceeded all our dreams about helping people with a new appreciation of the self aware nature of water (see the self aware pony tail of water - fractalfield.com/implodershower ). By delivering the correct direction of molecularly centripetal rotation of water into a centripetally potent magnetic array- we were definitely making a difference to the molecular cluster size: our solubility effect- key to most bioactivity. (The same essential flux symmetry is how the phase conjugate ark of the covenant taught gold atoms to be stable as mono clusters: goldenmean.info/goldpowder ). This is evident in the way the south magnetic pole will increase healing rate AND pain density, versus north pole - which by being centrifugal- decreases pain and healing rate (when applied to a wound- credit here: Don Lorimer "Mr Magnets'). This is made immensely more complicated by the fact that the only companies in the world actually making strong magnets in production quantities- are the Chineses (control virtually all the rare earth minerals needed)- these Chinese companies seem to DEFINE NORTH vs SOUTH magnetically - in the OPPOSITE WAY western physics does! Combine this with the fact that western physics has failed to note the fundamental difference between centripetal vs centrifugal flux as being in fact the defining symmetry of north versus south. I also believe this is actually the defining difference between plus versus minus charge- the new information being that it is in fact fractality that causes all electronegativity to be centripetal (and therefore life giving!). Relevant here is Nassim Haramein's powerpoint showing the flower that refused to decay after exposure to his centripetal (gravity making) magnetic- now we can teach how this works. SO- we thought we were doing a good thing- when we made the outer most magnet donut pair - at both ends of THE IMPLODER- to be south facing in. In fact we were dramatically serving the germination sprouting phase- but not quite as well the fruiting phase of the plant growth (acknowledgement to Professor Imhotep for his help here). The reason a rose is more likely to pop open in the hand of a yogi and saint- is his plasma (aura) is centripetal. Good for the pop open part of growth- not so much for the fold in (fruiting) part of growth. The other thing we learned- was that the part of the long magnetic cylinder we alternated around the water flow (stack of opposing donut magnets) which was actually working on the water molecules was mostly the part of the flux which was bent to focus perpendicularly toward the center of the flow- (the so called phase conjugate or z pinch point between the opposing magnets). So - altho we had the most powerful conventional magnetic toroids- actually the majority of the magnetic flux lines- did not all impinge efficiently toward center. SO - if thanks to me - we now know exactly the only symmetry which makes the conjugation of wave phases constructive and possible ( 2 sixty degree implosion pine cones learn to kiss noses)- we now can solve phase conjugate optics, phase conjugate dielectrics (well known to be bioactive : see Bearden at goldenmean.info/phaseconjugate) - AND phase conjugate magnetics. Phase conjugate magnetics was a term I originated and defined- which came to be associated with my film of 2 like poles of a magnet attracting (in fact it refers more to a centripetal magnetic implosive flux line symmetry which has a gravity and a growth effect) . Unfortuneately - we did not find a contract company to measure and prove that the flux lines between 2 donut magnets - whose LIKE POLES ATTRACT- were this geometry. (Making like poles attract - is something I first discussed at length in physics- but credit is due here to Valerie- and to "Joe" in australia- who first mechanically showed us). When I first coined the term phase conjugate magnetics- Elizabeth Rauscher was among the first to embrace the concept. Later I proved from my hydrogen frequency equation that the magnetic frequencies she used to eliminate pain in her FDA study - were in fact phase conjugate. (A technology I am now in the best position to commercialize- of course with acknowledgements to Elizabeth - because I can teach the principle- PAIN REDUCTION / HEALING- IS COMPRESSION RESTORED! - but that is another story- coming soon to fractalfield.com/icosaphi ). There is only one process in the world which makes a PHASE CONJUGATE MAGNET- and we are the first to bring them to you. The centripetal process in these magnets is unique- and is key to magnetic superconductivity eventually as well. (Hint to the Cern dummies who just lost half the worlds helium supply- all other forms of magnetic superconductivity are now practically ruled out. Also someone needs to tell those dummies wasting your tax billions- how to converge flux lines to fuse). In practice we are told a phase conjugate magnet can reverse it's polarity if exposed to a strong conventional magnet! You will be seeing much more on this. Meantime- we have the ideal magnet to now focus the flux lines (pine cones kiss) accurately and efficiently at the center of the flow in our Imploder water. The new SUPER IMPLODER - pictured here- is and will be much more potent than the original imploder. We have seen even animals line up to drink just the water imploded in this way. Do not take our word for it- try it for yourself. This design also can be virtually guaranteed to eliminate in pipe build up of deposits on the pipe walls. 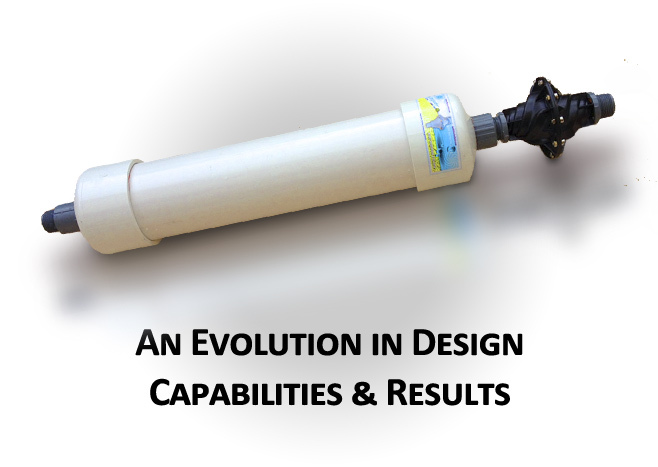 This design is the most potent water treatment device- available. Note- you must use extreme care with magnets of this potency.